Day at the San Diego Comic-Con International in July 2010. 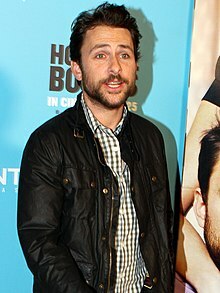 Charles Peckham "Charlie" Day (lahir 9 Februari 1976) adalah seorang aktor Amerika. Madigan Men Clerk Episode: "Three Guys, a Girl and a Conversation Nook"
2001 Law & Order Jeremy Episode: "Swept Away - A Very Special Episode"
2001–2004 Third Watch Michael Boscorelli Episodes: "Childhood Memories"
2004 Reno 911! Inbred Twin Episode: "Not Without My Mustache"
2011 Saturday Night Live Host Episode: "Charlie Day/Maroon 5"
Episode: "Jesse Judge Lawncare Incorporated"
Saturday Night Live Congressman Fenton Worthington Carrey Episode: "Jamie Foxx/Ne-Yo"
^ "Behind The Voice Actors - Charlie Day". Diakses tanggal 2014-01-06. 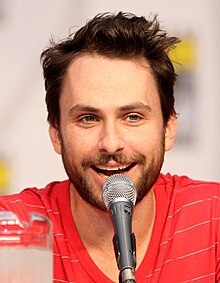 Wikimedia Commons memiliki media mengenai Charlie Day.